Barcode Technologies www.barcode-uk.com is now offering a comprehensive range of FMD 2D barcode datamatrix scanners for EU directive for pharmacies relating to Falsified Medicines EU Directive (FMD) which all community high street pharmacies will have to start using for validation of all medicines dispensed at their pharmacy shops. There is deadline of the Feb-2019 and these dispensing pharmacies must implement and install the 2D barcode scanners. We are here to help you ? Why do you have to authenticate ALL medicines and what is the clinical value behind this EU directive and what has been the problem in the past ? Here are some statics that illustrate the size of the problem and the reasons behind the Falsified Medicines Directive (FMD) EU directive . The World Health Organisation estimates that 1% of all medicines in the developed world are counterfeit, and that number goes up to 10% globally involving nearly 2,500 cases, EU Customs seized 27.4 million doses of falsified medicines at EU borders in 2011, an almost 700% increase from year 2007. The costs are in the billions each year and are extremely dangerous as a health hazard. European Union Parliament adopted the Falsified Medicines Directive and in February 2016, the Delegated Regulation supplementing Directive 2001/83/EC and 4 Annexes was published in the Official Journal of the European Union. Pan-European implementation of the directive has a delivery deadline of February 2019. The legislation requires the serialisation of every pack of prescribed drugs with a 2D Datamatrix barcode using GS1 or IFA/PPN standards. The process behind the legislation means that products can now be checked and verified at all stages of the Pharmaceutical supply chain namely by the manufacturers, the wholesalers and the pharmacist shops. This way, nobody else can reuse or falsify the product. 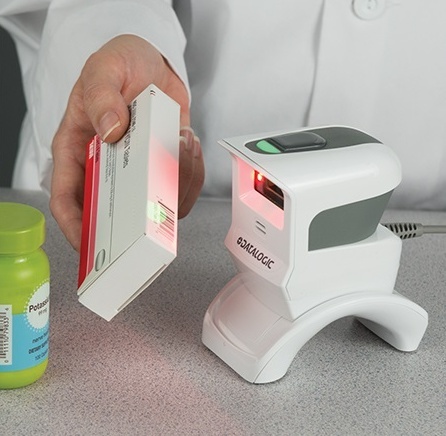 The 2D Datamatrix barcodes scanners will read/scan the barcode data that manufacturers will include on packs of medicines. Europe’s Falsified Medicines Directive (FMD) comes into full force on 9th February 2019 is a mandatory requirement for product coding, traceability and tamper-evidence will be enforced in over 30 European countries. Europe’s Falsified Medicines Directive (FMD) requires that all unit-of-sale pack of prescription medicines must carry a “safety feature” includes a 2D Data Matrix barcode and human readable data and must be also tamper-evident. The 2D datamatrix barcodes must contain a minimum of four pieces of information: batch number, expiry date, global trade item number (GTIN) and a randomized serial number. The data must also be printed in human readable form, ideally adjacent to the code. An example as showing on this page. Manufacturers will barcode their products and report encoded barcode data to a central EU Hub run by the European Medicines Verification Organisation (EMVO). This will push barcode information data down to appropriate national data repositories run by corresponding National Medicines Verification Organisations (NMVOs). High street pharmacists shops and stores will be able to scan these 2D barcode the point of sale and at the dispensing process as these codes will get checked against the local databases as not a counterfeit & falsified medicines, and thereby closing the counter checking loop. Newland HR32 Series Marlin Handheld Reader 2D CMOS Processor Decoding - 2D CMOS handheld reader (blue surface) with RS232 cable, multi plug adapter, autosense, smart stand ready.